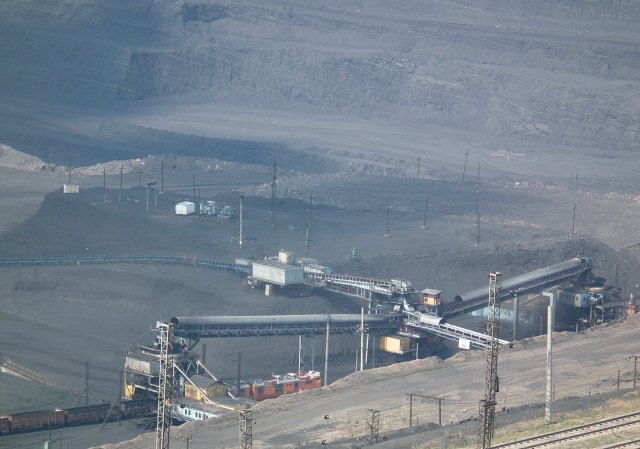 A gigantic black opencast coal pit near Ekibaztuz in Kazakhstan that is being mined on various levels simultaneously and features some machinery of humungous proportions. It is an amazing industrial wasteland: an infernal black pit of apocalyptic proportions. Simply breathtaking … if you can get admission to see it, that is. More background info: see under Ekibastuz in general and in the text below. What there is to see: it's one breathtaking spectacle to be behold, one of the most wow things I've ever set eyes on. The sheer size of the pit defies description. 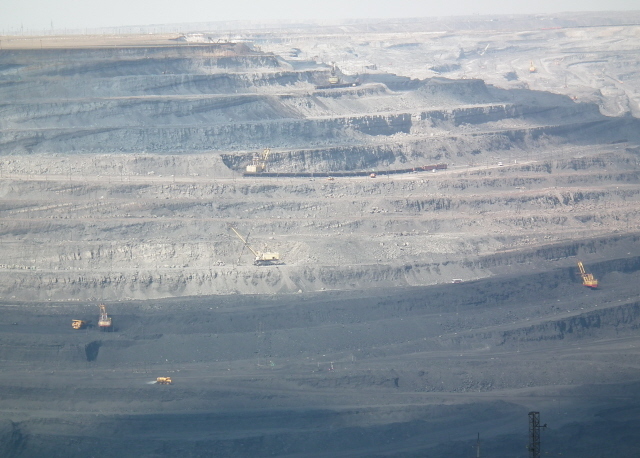 This is, after all, one of the world's largest opencast mines for black bituminous coal (lignite coal strip-mining is much more common, especially in Germany, and these sites can be just as gigantic – but they lack the deep blackness of the Bogatyr type of coal …). The vastness of the site is quite overwhelming from up here. Then the eyes strain to make out the items of machinery far away down at the bottom of the pitch-black pit – even though there are some true monster machines at work there. That includes the star piece of them all: the "the Big Wheel of Ekibastuz", a giant of a bucket-wheel excavator. It is joined by countless smaller, but still huge, other types of diggers and shovels. 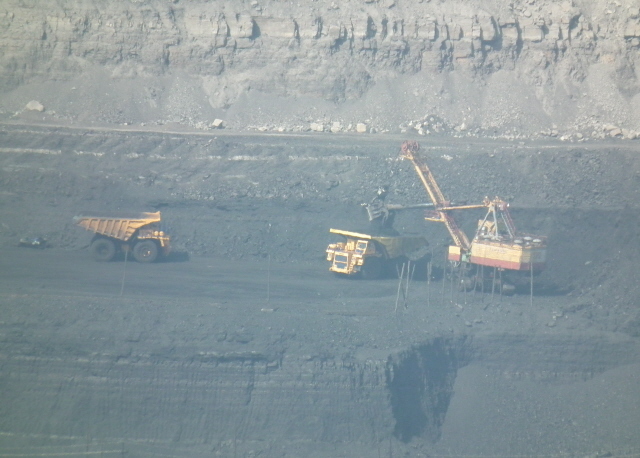 Some dig away in the black coal too, others are busy on the edge of the pit – loading the spoil/overburden onto monster trucks that take each batch out of the pit to be dumped on one of the spoil heaps surrounding the pit. From a distance, these trucks look like regular building site trucks – but they're enormous, each one as big as a three-storey house. 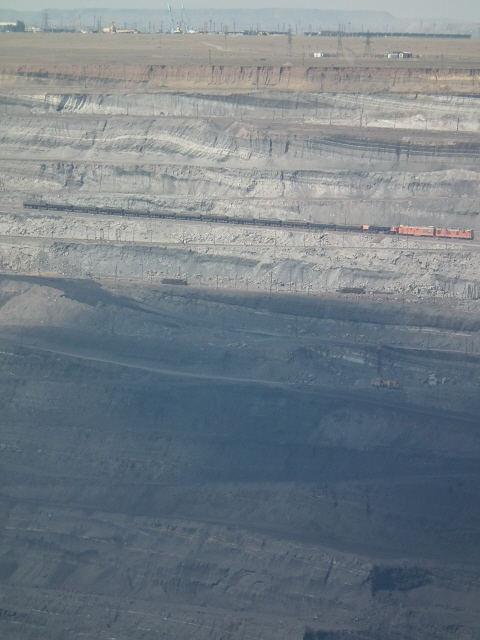 Dozens of trains, too, ply the miles and miles of railway tracks, getting coal to the powers stations or carting debris out to the spoil heaps. 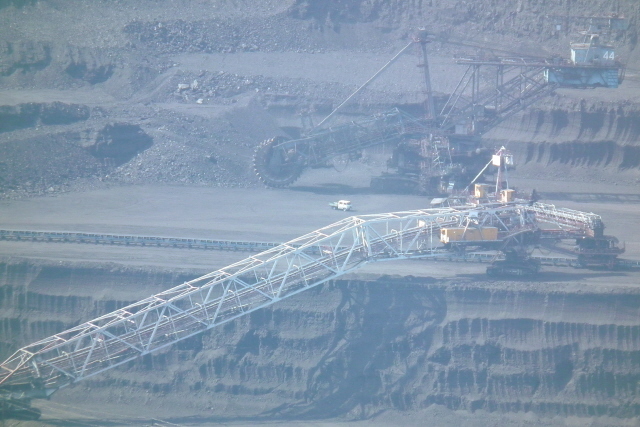 The walls of the pit are terraced, so that there are several levels on which such activity is going on simultaneously. Occasionally, the wind blew up huge columns of black dust which partly obscure the view down. This only added an extra infernal element to the whole spectacle. And it's all just a fraction of what there is. You can hardly make out where the pit ends looking up north to the far end. 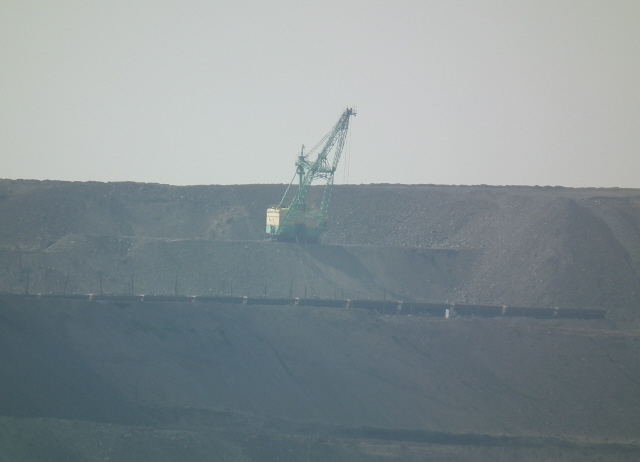 The chimney stacks of powers stations on the other side of the pit look like mere matchsticks in comparison to the depth of the black pit. These are dimensions that the eye is not used to – and hence it's difficult to put it all in perspective. Photography helps a little, especially with the aid of a good long zoom lens, to make out individual sections and observe what's going on – alternatively you'd need powerful binoculars or a telescope. The haze from the distances involved (and the dust) make it tricky to get any clear pictures, though (see the photo gallery below). Inside the tower with the viewing platforms there was some sort of exhibition, with charts, photos and even a model of the pit – but we were not given access to this, I could only make it out through the windows. Presumably this is for corporate guests only – just like the viewing tower normally is (see under access). 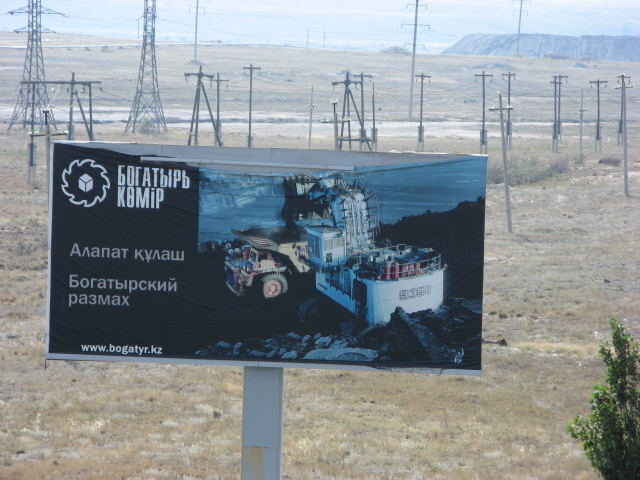 Even the drive along the approach road to the gate of the Bogatyr mine complex is quite something. You pass gigantic spoil heaps on either side of the road (one was emitting smoke! ), railway networks, all manner of industrial vehicles on the move – and yet more power stations belching out smoke. 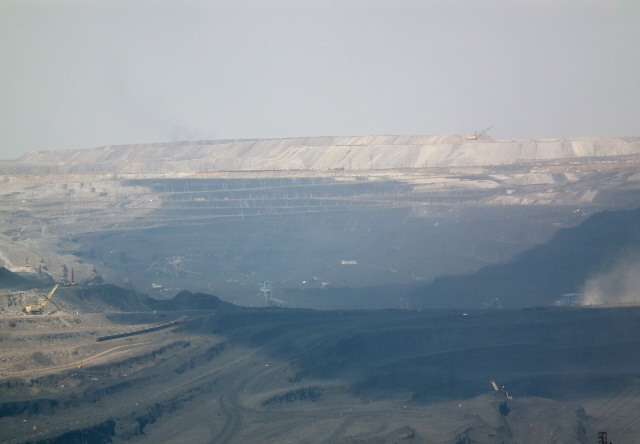 The latter alone would hardly be quite enough to justify a trip to Ekibastuz, though, so you should try and get access to see the big pit of Bogatyr itself too – you won't regret it. For me, short as the visit was, it was definitely one of the highlights of my trip to Kazakhstan. Very memorable. Location: ca. 10 miles (15 km) south-east of the centre of Ekibastuz in the east of Kazakhstan. Access and costs: very restricted indeed. Details: access to the Bogatyr mine's viewing tower involves a right bureaucratic hassle. 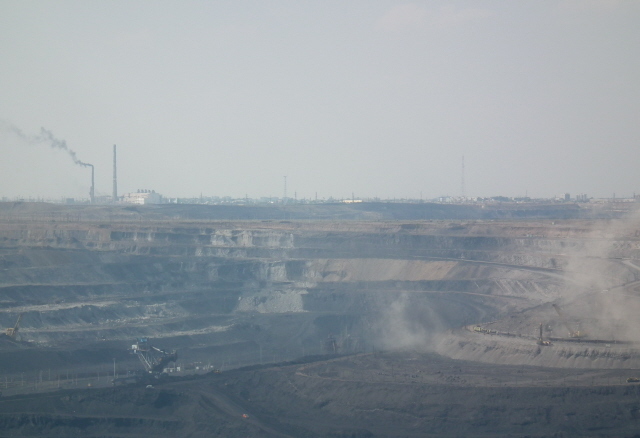 I went to Ekibastuz as part of a longer organized (tailor-made) tour of central and eastern Kazakhstan (en route to more significant places such as Semey and the Polygon), and had specifically requested to see the coal pits. My guide came equipped with an invitation letter that his agency had secured in advance. But when we got there with our local driver/guide, we were turned away at first. I can't quite say why, maybe the letter wasn't quite enough, or maybe it had to do with the fact that we got delayed en route from Astana (because our car had broken down and we had to proceed by bus, which cost us a number of extra hours). Anyway, our local guide was persistent. He took our passports and got on the case. The next day he picked us up again and we drove to the gate for a second attempt. After a long round of deliberations in the guard house, he eventually emerged with our passports and the good news that we could go in – albeit only for 20-30 minutes, and only to the one viewing platform on the south-eastern rim of the pit. Still, it was worth the hassle. Note, then, that as an independently travelling visitor your chances of being granted access to Bogatyr are probably as good as nil. So do prepare for this and use an agent and local guide to do the negotiations for you. It still may not work, but without it it's practically impossible. As for costs, see under Ekibastuz. Combinations with non-dark destinations: none – see Ekibastuz.